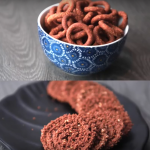 Ragi murukku is a deep fried spiral shaped savoury snacks. Ragi murukku or ragi ring is prepared with ragi flour (finger millet flour)along with rice flour, gram flour, wheat flour or combination of flours. Ragi murukku is very delicious and have all health benefits of ragi flour. 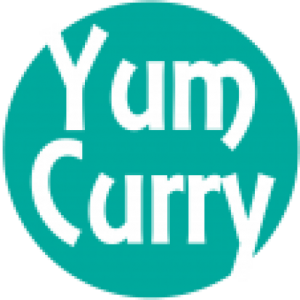 It is savoury crunchy snacks, originated in an Indian subcontinent and popular in southern India. In this recipe I will show you how to make this perfect and healthy tea time snacks step by step with photo. 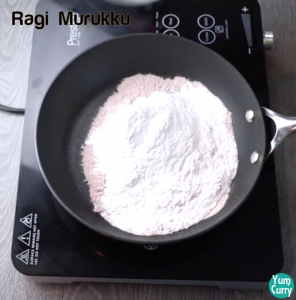 Ragi murukku is a delicious murukku recipe. It is made from Ragi flour ( finger millet flour), rice flour, gram flour and combination of flours. The flours are mixed with water, salt, asafoetida and either sesame seeds or cumin seeds. The mixture is kneaded into a dough, which is shaped into spiral and ring either by hand or using a mould later deep fried in oil. Many times I prepared murukku with rice flour and gram flour. I thought to give healthy twist this time by adding ragi flour and wheat flour both are healthy flours. Ragi flour in traditional Indian flour and used in many dishes. Ragi is super food since it is gluten free, rich in fiber and helps in weight loss and diabetes. It is also good source of calcium and amino acids and vitamin D. After knowing its health benefits. I have tried so many recipe with ragi flour like dosa, pan cake, porridge. I will share recipe soon. Ragi murukku taste almost same as murukku, very delicious and crunchy. 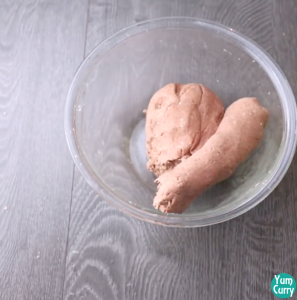 If you want to include this super food in your diet, you must try this recipe. 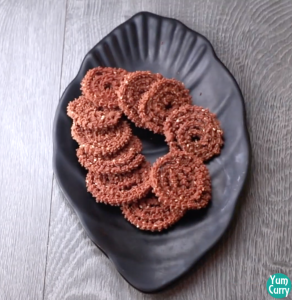 Murukku is generally prepared during the festival seasons like diwali or holi and diwali is round the corner what could be the best time to include these crispy and healthy snacks in your diwali preparation. 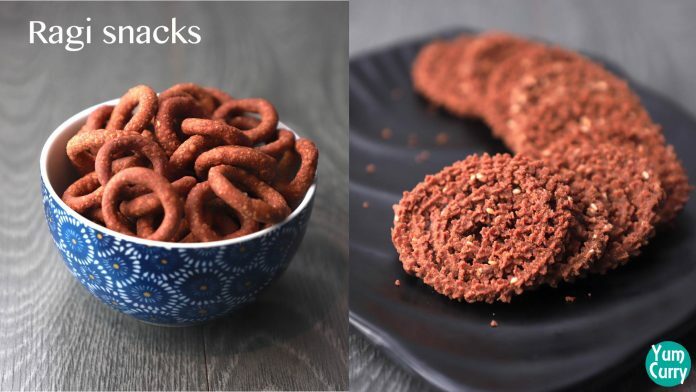 Murukku is deep fried snacks and it is prepared by using flours, so it has good shelf life you can store them for 15-20 days into an airtight container. Murukku is prepared with rice flour, gram flour and black gram and It is spiced up with ingredients such as coriander powder, cumin seed, sesame seeds, red chilli powder, turmeric powder, salt, asafoetida(hing) and oil. Today I am making Ragi murukku and main ingredient is ragi flour along with rice flour, gram flour and wheat flour. In spices I am adding hing, salt, cumin seeds, sesame seeds and butter. 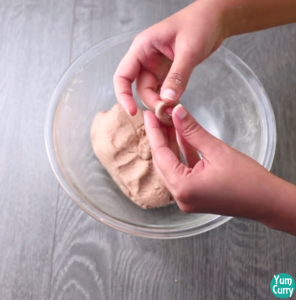 For making ragi murukku first we prepare dough and then shape up murukku and later fried them. As we are preparing murukku in two ways for spiral murukku, we use murukku maker and if you do not have murukku maker you can try second one which is ring shape. 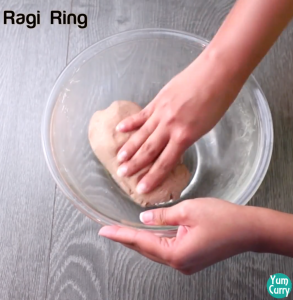 For preparing dough take Ragi flour and rice flour let them dry roast for 5 minutes in low medium heat. It will remove rawness from ragi flour. 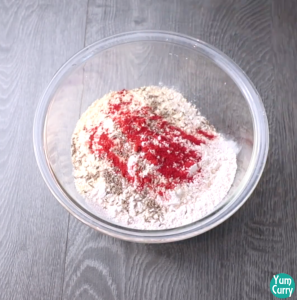 I am adding all flour in the same proportion. 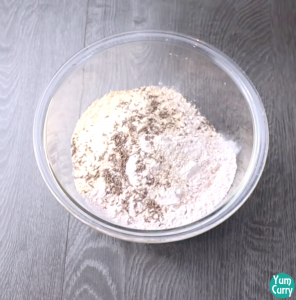 In dry roast ragi flour(finger millet flour) and rice flour add gram flour and wheat flour. Add all spices, butter and mix all ingredient. knead soft dough with lukewarm water. Leave the dough for 10 minutes. Dough should be kneaded soft for perfect murukku, if your dough is sticky you won’t be able to shapes murukku and if it is too hard murukku will brake when you fry them. Till the time dough is resting keep ready murukku maker, Grease the maker by using oil. 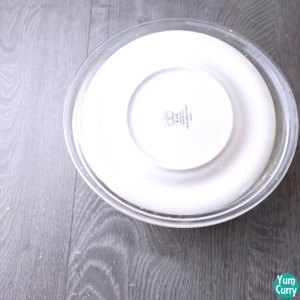 After 10 minutes uncovered and knead the dough again, fill the murukku maker with dough. 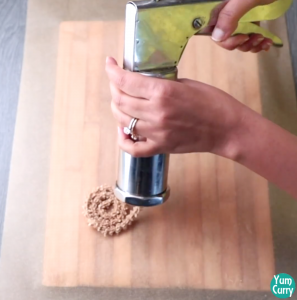 Place butter paper or aluminium foil on your kitchen counterpart so it will be easy to remove murukku for frying. start pressing murukku maker and move in round to give it spiral shape. 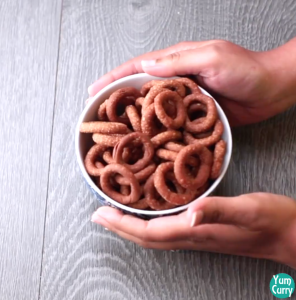 If you do not have murukku maker you can make ring murukku, for making ring murukku take small portion from the dough. Roll between your palm and make a 2 inch long string, join both end and give it a ring shape. 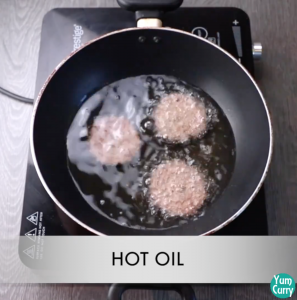 Take a pan for deep frying, heat oil. 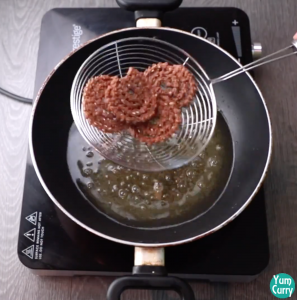 It is important to fry murukku at the right temperature. 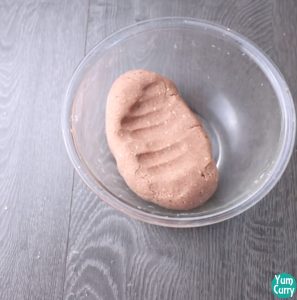 To check the temperature take a small piece of dough and drop it in the hot oil. 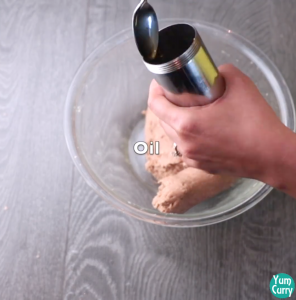 If dough gradually comes up it means oil is ready for frying. 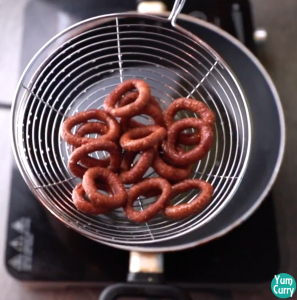 Fry murukku on low medium heat until they turn golden brown. Take them out on the kitchen towel to soak excess oil. 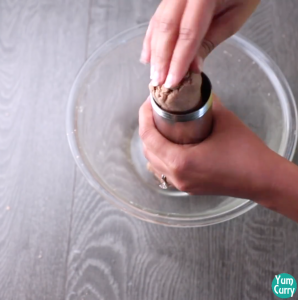 Dough should be soft and moist for perfect murukku. Fry murukku on low medium heat else they turn brown without cooking from inside. 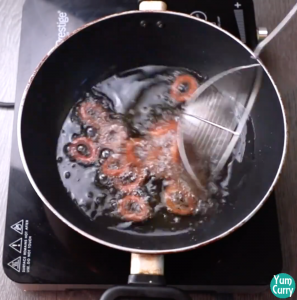 When you slid the murukku in the oil, make sure oil is hot enough else they will absorb too much oil. For maintaining crunchiness for long time always store murukku into an airtight container. I have prepared more recipe for diwali like coconut barfi, instant peda, namak pare, ribbon pakora, karela mathri, mysore pak, kaju katli, rasmalai. Click on the name to get full recipe. 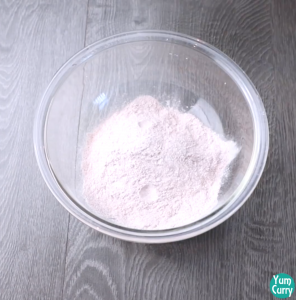 Heat a pan and add ragi flour and rice flour to it. 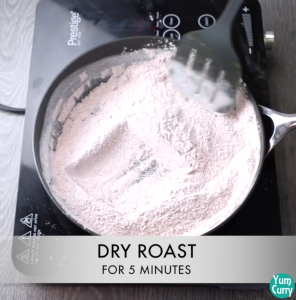 Dry roast flours on medium heat for 5 minutes. Keep stirring. 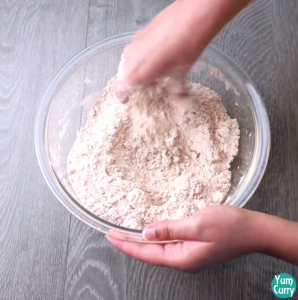 Transfer roasted flours to a mixing bowl. Let it cool enough to handle. Now add gram flour, wheat flour, cumin seeds, sesame seeds, chilli powder, hing, salt and butter to it. Mix all ingredient well. 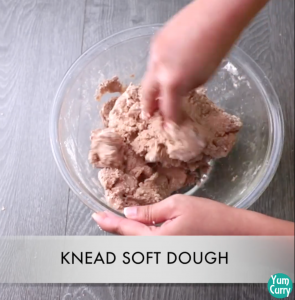 Knead a soft dough with lukewarm water. Cover and let it rest for 10 minutes. 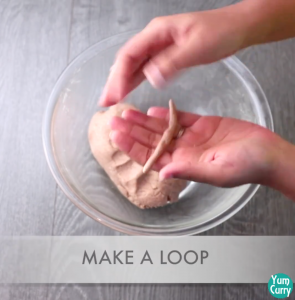 After 10 minutes, knead the dough again for a minute and divide it into 2 parts. Take a murukku maker and grease it with oil. 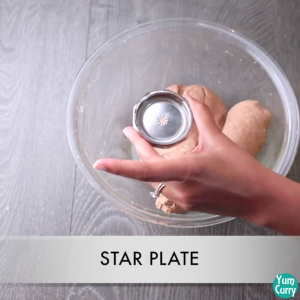 Use a star shaped plate to make murukku. 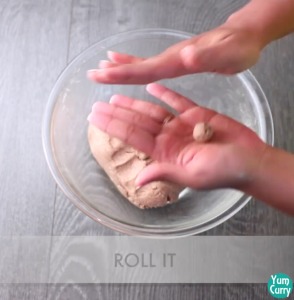 Roll the dough between you palm and give it to a cylindrical shape, fill this dough in to the murukku maker. Presse murukku make and make spiral shape murukku. You can place butter paper so it will be easy to pickup murukku. 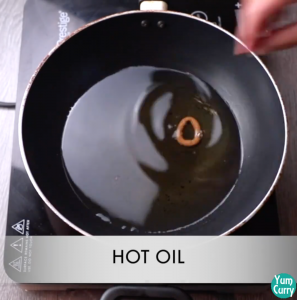 Heat oil in a pan, slid murukku to the hot oil. 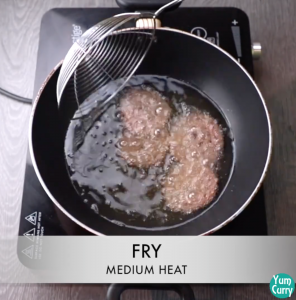 Fry on low medium heat, rotate or move continuously. When they turn golden brown, take out on kitchen towel to soak excess oil. Take small portion from there dough. Roll between you palm. Make 2 inch long string. Join both end and pinch at joint. Press murukku make and make spiral shape murukku. You can place butter paper so it will be easy to pickup murukku.